Senate President Mike Thibodeau is seen in this July 16, 2015, file photo. 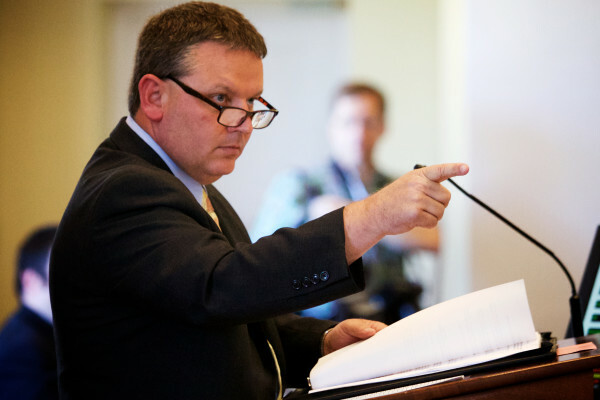 Democratic Speaker of the House Mark Eves is seen in this June 30, 2015, file photo. AUGUSTA, Maine — The top Democrat and Republican in the Maine Legislature will present a united front to the state’s high court in a legal conflict over 65 disputed vetoes by Gov. Paul LePage. 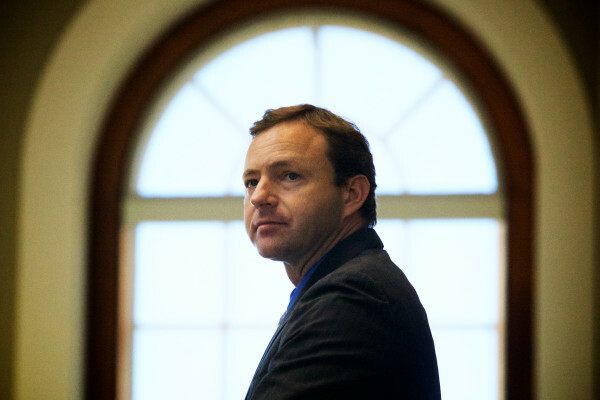 Senate President Michael Thibodeau, R-Winterport, and House Speaker Mark Eves, D-North Berwick, will file a joint brief to the Maine Supreme Judicial Court by the end of this week. The court gave LePage, the House and the Senate — as well as any other interested party — until 4 p.m. Friday to file initial written arguments. Oral arguments are scheduled for July 31. LePage, a Republican, argues that 65 vetoes he delivered to the Legislature on Thursday, July 16, must be considered for override votes. The presiding officers of the House and Senate dismissed the vetoes as being out of order, saying the bills in question already had become law because LePage missed his 10-day constitutional window of opportunity for acting on them. The governor then asked the Law Court to weigh in on whether he had really run out of time, arguing that by adjourning temporarily on June 30 and not returning until July 16, the Legislature had prevented him from returning the vetoed bills. Democratic attorney general Janet Mills agreed, writing in a legal opinion that LePage had run out of time. Thibodeau said Tuesday he and LePage have not spoken about the veto fracas but that he, like Eves, believed the bills have become law. In a written statement, Eves said he and Thibodeau were united because the fight with LePage was not a partisan one. Eves and Thibodeau will be represented by Tim Woodcock, a Bangor attorney with Eaton Peabody, who formerly worked for U.S. Sen. Bill Cohen, R-Maine. House Minority Leader Ken Fredette, R-Newport, said Tuesday he disagreed that the Legislature would speak with one united voice. Fredette has been the only caucus leader in the State House to side with LePage in the veto dispute. “House Republicans have been consistent from the start of this issue, that they would like an opportunity to have a vote, up or down, on each and every one of the separate bills the governor has vetoed and that are currently in dispute,” Fredette said in a written statement. Fredette, who said earlier this year that House Republicans were left out of budget negotiations between Democrats and the Senate GOP, said his caucus is being ignored. “House Republicans have previously been excluded from important legislative decisions this session, and are once again being excluded from participating in this critical constitutional discussion,” he said. Fredette said he wanted the Legislative Council — the five Democrats and five Republicans elected to leadership positions — to fund separate legal counsel for the House Republicans at the Law Court.